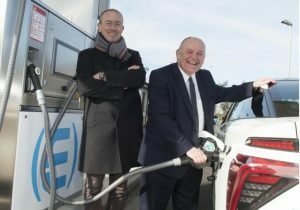 The city of Aberdeen has opened its second hydrogen refuelling station as local fleets take delivery of Toyota Mirai hydrogen fuel cell saloons. (L-R) Hydrogenics CEO – Filip Smeets and Aberdeen Councillor Barney Crockett at the opening of the new hydrogen refuelling site in Aberdeen. The £2.6m Aberdeen City Hydrogen Energy Storage (ACHES) facility is funded by Aberdeen City Council, ERDF, Transport Scotland and Nestrans, and will be fully operational mid-March. Located in Cove, ACHES has four electric recharging points and has the potential to produce 130kg of hydrogen per day. Enabling fast refuelling, hydrogen is dispensed at 350 bar and 700 bar pressure. There are also training facilities on site to investigate opportunities within the hydrogen supply chain. The launch of the site comes as local public and private sector fleets deploy 10 Toyota Mirai cars. The vehicles are on lease for three years with five going to the NHS, three to the Co-Wheels car club, one to Scottish Environmental Protection Agency (SEPA) and one to Aberdeen City Council. The vehicles are part funded by OLEV’s FCEV Fleet Support Scheme, which has awarded private and public sector organisations a share of £2m to deploy hydrogen fuel cell vehicles.